Unlike before, where only Internet Explorer and Firefox are the most known browsers on your computer and only few mobile devices are capable of browsing to the internet via cellular network. Early 2000's when mobile devices are started getting popular for communication, mobile software developer also started developing browsers for handheld devices. Aside from Opera Mini, one of fast growing browser nowadays is UC Browser. 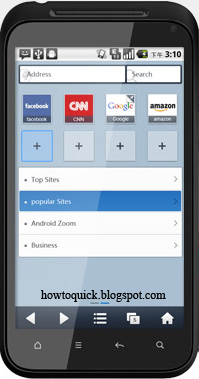 UC Browser (formerly known as UCWEB) is a Web and WAP browser with fast speed and stable performance. It supports video player, website navigation, Internet search, download, personal data management and more functions. UC Browser, the leading mobile internet browser with over 300 million users in more than 150 countries, is available in all major operating platforms including iOS/Android/Symbian/Java/Blackberry, and more. To those who want to this mobile browser on their phone, you can follow the steps on how to get the official UC Browser app for you mobile. You may choose your mobile unit model, by default it auto detect. Choose the latest version that suite on your mobile unit. For popular devices like Android and iOS, you can also get this app by downloading on Play Store or Apple Store. You don't need a credit to install this app as it is available for free. Free internet browsing tweaks - this is one of the best feature i had experience with UC browser or UCWeb. The java version can be modified or been modified by Handle UI version to input and tweak server settings to gain free internet access via GPRS/3G cellular network. Downloading - this is also one of the features that I admire with UC browser, for me it handles perfectly in terms of downloading huge files using your mobile phone. Affiliate, link exchange - if you're a wap master like me before, UCWeb promotes your site when you apply to become an affiliate of UCweb browser via banner. Those are just few thing I benefited using the UC Browser, if you happen to use this cool browser feel free to share your experiences about this by hitting the comment button below.